How Can I Help YOU? Physician coaching looks at service. Recently a friend interviewed a prospective employee for her practice. “How much would you like to be paid?” my friend asked. The woman told her and they agreed. In their next discussion, the prospective employee remarked that she would really need a higher hourly wage. Following that, she changed the date she would be available. When my friend rescinded her offer of employment, the woman backtracked and offered to work for less and start earlier. It was too late. Her true colors had shone through. It reminded me of an interview in which Sheryl Sandberg, COO of Facebook and author of Lean In, discussed how she decides whom to hire. Most people, she mused, try to convince her why they are the best applicant. She remembered one prospective employee who said, “I could tell you all about me, but what I really want to know is what’s your biggest problem and how can I help you solve it?” Sheryl hired the person immediately. Master networker Keith Farrazzi, author of Never Eat Alone, stresses that when one looks for a mentor, meets a new person at a meeting, or attends an interview, it’s important to find a way to serve that person, rather than only looking for what the person can provide to you. Is there a connection you can make for them to a likeminded person? Is there a paper you can send their way that discusses a subject you two spoke about? Any healthy relationship needs to have give and take – when we sense that concern is only going in one direction, we are less likely to offer any more. And truly, one of the easiest ways to find fulfillment and make ourselves feel better about our lives is to do something for someone else. When seeing patients in the office, most physicians start the encounter by asking an opening question. 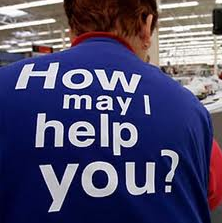 My favorite is, “How can I help you today?” It starts the interaction by making it clear that I want to help my patient. Although it’s implied and often assumed, by stating my intention, I immediately convey that I want to care for them in a way that would be meaningful to them. It also helps focus the patient on the concern that brought them in. I often hear people lamenting the fact that we live in a “me society.” Social media, with its ease of broadcasting each moment of our lives, and smartphones that allow us to take “selfies” (and immediately put them on social media) have enhanced the sense that we are the center of our, and many other people’s worlds. Why not spend the next day asking yourself how you can help each person you interact with? My guess is your life will feel even more fun and fulfilling. You might deepen a friendship. And maybe even get the job you’re looking for. This entry was posted in physician coach, physician coaching, physician communication, physician fulfillment and tagged Building relationship with patients, communication in healthcare, Keith Ferrazzi, patient satisfaction, Sheryl Sandberg. Bookmark the permalink.